Will Homecoming Bring the First Win of the Season for Charlotte? 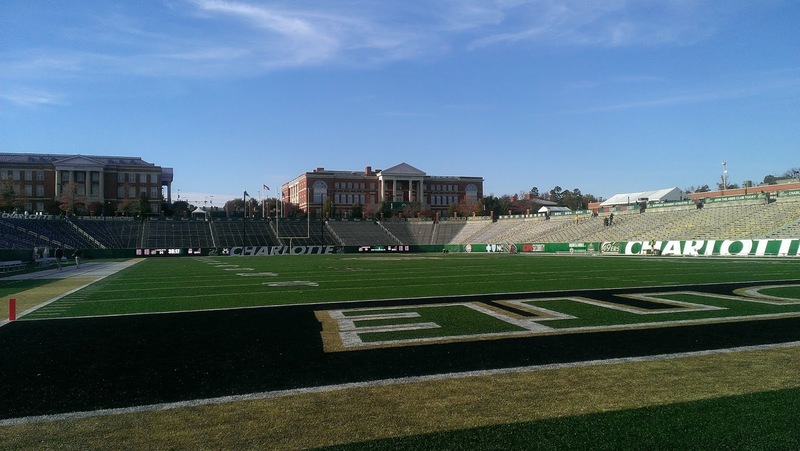 Charlotte (0-7; 0-3) hosts UAB (3-2; 1-1) in the 49ers Annual Homecoming Game. Charlotte has dropped three straight league games and is looking for its first win if the 2017 campaign. With injuries mounting, the 49ers saw four players make their first start and a total of eight lineup changes in last week’s 45-14 loss at two-time C-USA defending champ WKU. In addition, all-time leading tackler Karrington King left the game in the second quarter with a knee injury. UAB meanwhile returned from a bye week to win back-to-back home games against Louisiana Tech (W, 23-2) and Middle Tennessee (W, 25-23). This is the 49ers first meeting with UAB and the last game before the bye week. Charlotte R-Fr. RB Aaron McAllister rushed for a career-high 157 yards at WKU, the third different 49er (Benny LeMay; Hasaan Klugh) to post a 100-yard rushing game this year. LeMay and Klugh both missed the WKU game. At WKU, McAllister (89-yd TD run) and backup QB Brooks Barden (77-yd run) had the two longest runs in school history. QB Hasaan Klugh has accounted for 10 of the 49ers 12 TDs with 5 passing TDs and 5 rushing TDs. Charlotte rushed for the program’s FBS record of 349 yards in a one-point, 30-29 loss at FIU. Soph. RB Benny LeMay has had two games of over 150+ rushing yards, including a career-high of 178 at FIU. He ranks 6th in C-USA with an 81.3 rushing avg. The 49ers defense suffered a blow with the loss of all-time leading tackler Karrington King (62 tackles; 8.9/gm) at WKU. He became the first 49er to record 50+ tackles in four straight seasons. Soph. DB Ben DeLuca is second on the team with 58 tackles after back-to-back double-digit tackle games (49ers’ FBS record 17 vs. Marshall; 10 at WKU). He became the 12th 49er to reach 100 career tackles (126). DE Zach Duncan leads the team with 5.0 TFL, 3.0 sacks and 4 QBh. “We’re looking forward to coming back home and playing UAB. They’re a pretty old team and are hot right now. They have beaten two really good opponents on the last play of the game in Middle Tennessee and Louisiana Tech. They present a lot of problems and Coach Clark has done a good job of building the program… They’re a really old football team. Just because they dropped football and starting back, you can’t be deceived. They have a lot of old guys and are a very mature football team. It all starts with their QB. He’s an older guy, playing extremely well and has got great balance. They have the ability to throw and run the ball at a high level. UAB also has a freshman tailback who I really like… It’s a tough challenge this week and it’s good to back home but we have a tough task at hand. We’re going to need to have a great week of preparation to get ready for this UAB football team that is very confident right now." "As we start to look at the next game it’s time to get a road win. I would say that I think Charlotte has been really close and has started to make some changes a few weeks ago offensively that has really made a big change for them. They should have beaten FIU and played Marshall right to the wire and last week the quarterback was out and the leading rusher was out and they also had some defensive guys out. To me that game is not indicative of who they are and they’ve got us for their homecoming and we’ve got to go on the road and play well and do our jobs. We should not be anything other than humble and guys wanting to work and I think we’ve got some guys that are really starting to believe in what we’re doing and we need a great week of practice." Jerry Richardson Stadium, Charlotte, N.C.